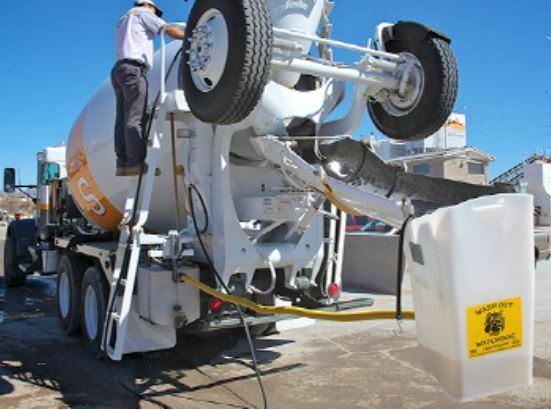 The driver does not have to drive to a pit or wait for someone to bring a container to wash in. They have all they need at their disposal to handle the washout. It is designed to be extremely efficient. When the driver uses it as it is intended, they grab the bucket on the way to the back of the truck to washout, it drains while they are rinsing down the fins and then they return it to the rack on their way back to the cab. Back at the plant – the bucket and tank are designed to be emptied and maintained after they are loaded for their next round. It takes less than 60 seconds to drain, empty and washout both the bucket and the tank. This can all be done while they are rinsing down the truck and setting their next load. It is designed to be a simple, fast, long lasting and easy to maintain asset to every ready mixed company and their drivers. For more information on the Washout Watchdog Gravity-Fed Rinse Out System, click here.